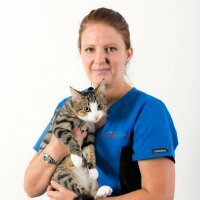 Lisa completed her Certificate IV in vet nursing in 2000 and worked in general practice for a year. She then joined emergency medicine and hasn’t looked back since. Lisa worked in 3 emergency centres in Sydney. She moved to Queensland in 2009 where she worked in Brisbane before starting at AES in 2010. She is currently completing a diploma in Human Resource Management. Lisa has 3 children, 2 cats, a Pomeranian cross and a rescued rabbit (yes, she lives in New South Wales).